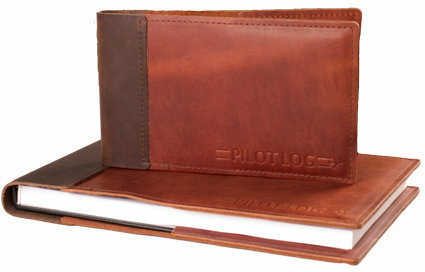 The handsome Leather Pilot Log Cover is a great and unique gift for yourself or the pilot in your life. Easily slips right over the top of your existing logbook! As pilots, we use our logbook not only to meet the FAA record-keeping requirements, but as a journal of all of our aviation adventures. Something to be cherished and protected. This hand-made leather log book cover is crafted right here in the USA by experienced craftsmen. It's a quality piece that will protect your logbook for many years and flying adventures yet to come. Covers for the Standard Size ASA and Jeppesen logbooks are also available here. Logbook not included (sold separate). Available in either all black or saddle with a dark brown spine accent. Review: Fits Jeppesen Professional Logbook perfect. Pros: Good fit. Nice leather smell. Review: It's SWELL! Plan to get a couple more for my older (completed) log books. Review: A great way to protect your flight log books. Good fit. Looks professional and sharp. Plan to get a couple more for my older (completed) log books. Review: Cover fits well and fully met my expectations. The quality of the cover is superb and snugly fits the log book. Several others have commented on the cover and asked where I bought it. I'd suggest this cover to protect the log book to anyone. Review: Fits very nicely, great craftsmanship, and all around super product. Pros: Durability, feel and appearance. Review: This is my second log book cover. Initial fit it tight but it wears in after it has been used and will fit perfectly. We'll made and it looks classy!! Cons: A little hard to fit initially. Yes, both the SP-30 and the SP-40 logbooks are 7.5" x 4" and will fit perfectly in this leather cover.